Bohag Bihu, also known as Rongali Bihu, is the Assamese New Year and is observed for three days as per the traditional Assamese Calendar. The New Year is observed on the first day of Bohag month. The Hindu New Year celebrations in Assam begins on the last day of the Assamese month ‘Chait.’ In 2019, the date of Bohag Bihu is April 15. The first day of celebration is dedicated to cattle and is April 14, 2019. The word basically implies that people ask for blessing from gods for good rain and good harvest. The first day of the Rongali Bihu New Year celebrations which falls on the last day of Assamese month ‘Chait’ is known as ‘Goru Bihu’ (the festival of cow). In 2019, the date of Goru Bihu is April 14. The second day of Bohag Bihu celebrations is known as ‘Manuh bihu’ (the festival for the people). It is popularly known as the traditional Assamese New Year – Rongali Bihu or Bohag Bihu. It is observed on the first of Bohag month. In 2019, the date of Bohag Bihu is April 15. The third day of Assamese New Year Bihu celebrations is known as ‘Gosain bihu (God’s bihu). In 2019, the date of Gosain Bihu is April 16. One gets to see a rejuvenated Mother Nature during Rongali Bihu. The festival is directly related to the changes taking place in nature. Mother Nature replaces her old garb and everything is fresh. Everything is positive and this rekindles the hope of the farming the community. On the Goru Bihu day, cows which are vital to the agrarian economy and rural life of Assam are given a ritualistic cleansing. Livestock are rubbed with a paste of Matikalai (a kind of local pulse), mustard and turmeric. Then they are given a proper washing in the ponds. Vegetables like gourd, brinjal, turmeric and bitter-gourd are thrown at the livestock. The cowshed is thoroughly cleaned and is smoked with incense to remove all pests. Livestock are fed with fresh vegetables and rice cakes and are also thoroughly cleaned using ‘Dighalati leaves’ – a plant with medicinal value. In the evening, they are tied using new ropes. The preparation for Manuh Bihu or Rongali Bihu begins on the day of Goru Bihu. Most women apply mehandi on their hands and feet on this day. On the New Year day, people visit friends and relatives and exchange Gamochas – a unique cotton towel to Assam. Hussori troupes visit households and present Bihu song and dance performances, especially in the rural areas. Youngsters take the blessings of their elders and are sometimes given gifts. The highlight of the Assamese New Year is the performances of dances like the Huchori and Bihu. 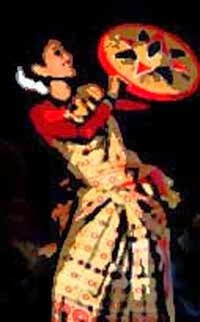 Bihutolis (community Bihu pandels) come in towns and cities and organize song and dance competitions. The foxtail orchid (locally known as Kopou Phool) blooms during the season. Special food prepared on this day includes Jalpaan and pithas. The food mainly consists of rice and coconut. Jalpaan comprises of Chira Doi (half boiled rice mixed with curd), Aakhoi (fried corn), Gur (sugar), Sandahguri (wet rice pounded into lumps). Burnt banana stems - the middle part of banana which has banana hanging from it.